Terrifying post-truth interpretations from R.Scott Bakker. How do you make democracy work in such circumstances? You don’t. You ditch democracy and implement quantum computing background care-taker AGI. Opinion needs to be taken out of the social engineering equation altogether, for the very reasons Bakker continues to identify. 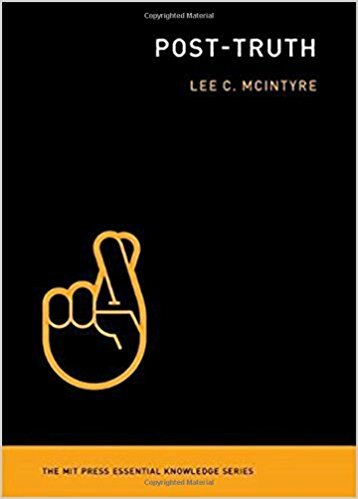 Lee Mcintyre is a philosopher of science at Boston University, and author of Dark Ages: The Case for a Science of Human Behaviour. I read Post-truth on the basis of Fareed Zakaria’s enthusiastic endorsement on CNN’s GPS, so I fully expected to like it more than I ultimately did. It does an admirable job scouting the cognitive ecology of post-truth, but because it fails to understand that ecology in ecological terms, the dynamic itself remains obscured. The best Mcintyre can do is assemble and interrogate the usual suspects. As a result, his case ultimately devolves into what amounts to yet another ingroup appeal. As perhaps, we should expect, given the actual nature of the problem. I don’t think it’s entirely fair to equate the argument that ‘truthiness’ as an approximation of understanding of certain social processes with the ‘mythic fall of man’. What this does is obscure how public discourse has become solely an exercise in rhetoric + disinformation. Truth may never have been available to us but at least there was efforts made to clarify and have public discussions about how to perceive social processes. That is what is lost now. There is no attempt even at trying to develop a coherent narrative. It has become a total storm of noise. It’s the magnitude of the lies and disinformation that has changed – completely obliterating any semblance of communicative rationality. The job of media and public deliberation is to offset biases and dispositions, to work with our limitations to provide touchstones for reflection and debate. That is gone. its all advertisements and empty signifiers. To say it’s ‘same ole, same ole’ seems dismissive and does nothing to identify possible lines of flight. not any more lost than it’s ever been.